They hunt from a perch, dropping down onto small rodents and athropods. 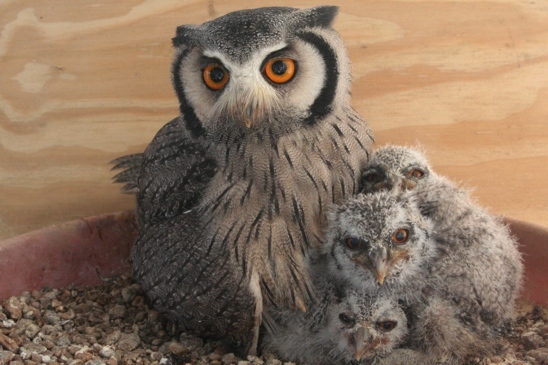 These owls lay their 2 to 3 eggs in the old nests of other birds. Some of their vocalizations sound remarkably like that of a cat: they also purr and yeowl! The Southern White-faced Scops Owls on display in “hoot Hollow’ are named Geisha and Judo. They lay eggs and raise chicks almost every year During breeding season the little male is so protective of his family that Sanctuary staff draw straws as to who is unlucky enough to clean their cage and face the wrath of this brave, hissy, yeowlly owl!